Pesaru garelu is a popular snack in Andhra Pradesh. No festival is complete without Garelu, pulihora, sweet and payasam. Many of you including me usually end up making some medu vada, Masal Vadai, Paruppu vadai, mysore bonda. For a change try this Pesaru vada for diwali. I love to prepare some tasty nibble with tea especially during weekends when everyone at home. It hardly takes less effort, few ingredients. But remember to soak for 6 hours prior you make for tea treat. Best to enjoy, hot from the skillet, when it is crisp. The whole some highly protein rich vada can be relished with chutney. Green Chilli - 3 no. Soak the bean with sufficient water overnight or preferable 6 hours. Next day morning drain water and grind the bean with chilli, ginger, salt to coarse or smooth paste. Add water as needed to avoid batter getting stuck to the bottom of the jar while grinding. Transfer the batter to the bowl. Mix the finely chopped coriander and mint leaves to it. Heat sufficient oil for deep frying in a deep bottom vessel / kadai . After few minutes check for the oil temperature whether it is ready for frying vadai by dropping small amount of the batter over the oil if it comes to the top then perfect. Keep water in a small cup by the side to wet your hands while making vadai (this will help to shape good vadai and avoid stickiness with hands). Slightly wet your hands in water, take some required amount of batter and flatten a bit , make a same hole in the center with thumb(here again slightly wet your thumb to make perfect hole). Drop slowly and carefully in the hot oil without spilling over you. Deep fry both sides till crisp golden brown over medium flame. Repeat with remaining batter to make vadai. Adding very less water while grinding the batter helps to yield good shape vadai, gives fluffiness, absorbs less oil. Adjust chillies as per the spice level. Add some fennel seeds while to get good flavor. Soaking the bean for the above mentioned time helps to grind the batter smooth and faster. For variation can use split mung bean too. Add some chopped onion to make more tasty. Murukku is a popular south Indian savoury treat and murukku means twisted in tamil. All these kind of savouries has special place in diwali/deepavali. Diwali is round the corner as just three days left and I would like share with you this Thayir murukku recipe. This is different from regular murukku as it is made with curd and rice flour combination. Thayir murukku, my all time favorite savoury treat since from my childhood. My Amma makes it more deliciously whenever I ask for this murukku. Even my daughter is a great fan to this spicy sour Murukku. The addition of curd to the dough instead of water gives it entirely a unique taste that crave you to have for more without a doubt. This thayir murukku is crispy yet soft as other murukku with a nice taste to relish. Sift and combine the rice flour, maida, chilli powder, salt, sesame, asefoetida and oil in a mixing bowl. Beat one cup of curd and pour gradually using spoon to the flour mixture little by little. Knead well to get a stiff and non sticky dough. Cover the dough with a wet kitchen towel and let it rest. Heat sufficient oil in a deep kadai or wok and fill the prepared dough in the murukku maker using the slotted dice as shown in the figure. Press to make a circular murukku to the oil directly or do it in the back of the ladle and fry in the hot oil. Make sure to fry in the medium flame to fry evenly. Fry the murukku until golden brown both sides. Drain in the colander lined with kitchen tissue, repeat to finish the remaining dough. Cool the murukku to room temperature before storing in a container. The murukku stays good for 10 days. You can add ground green paste instead of chilli powder as a variation. You can replace sesame seeds with cumin seeds. Sour curd can work well to this murukku. Add curd little by little as needed to form a stiff dough. Check out diwali recipe collection and diwali sweet recipes. Kachori is a very famous savoury recipe in India. A Crispy outer layer and spicy tangy filling make it so tasty and delicious that it doesn't need any accompany with it. It is normally made with different types of stuffing sometimes dry or sometimes wet stuffing with veggies or paneer or cheese. I made dry kachori using dry fruits and powdered lentil. Best thing is it can be stored as long as for a month unlike wet kachori. In my hometown Jamnagar there is a famous shop "Jain Vijay" for this dry fruit kachori and they export these kachories all over the world. I got exact same taste and texture of jain Vijay kachori. My hubby says after my attempt "now no more orders for jain Vijay from our family" !!!! This words are worth my efforts and time I spent to make kachories!! Try out my recipe to make Dry Fruit Kachori this festive season. Pack them in a nice box and gift it to your relatives and friends!!! Diwali - festival of lights bring loads of happiness, glory and excitement to all. Its time to relish the favorite sweets and snacks, wear new dresses, sending greetings to all, burst crackers and lots more to do. Its time for people to hunt for best diwali gifts to their near and dears. The whole day will be delighted with festive mode, filled with laughter, visit to friends and relatives, share their wishes. We have listed few of sweets that are fail safe recipe to try for this Diwali/ Deepavali. All these ten recipes are delectable treats for the festival.Try these easy sweet recipes, enjoy the diwali with oodles of joy. Kalakand is a very a very popular sweet made with sweetened milk and Indian cottage cheese. Its easy to make and tastes extremely scrumptious with soft, grainy texture. I gave it a little twist of chocolate flavour specially for my son who is a chocolate lover. Try this easy recipe on this Diwali season and learn how to make chocolate Kalakand Burfi. Diwali is nearing, festival sweets and savories preparation are in full swing at home. Hope you too busy with the same. Today I want to share the most easiest and tastiest Burfi made with pumpkin seeds. Yes it is popularly made at our home and the recipe is carried through generations. Amma and MIL use to make burfi regularly for all occasions. Diwali is round the corner and I know you all are busy with pre-preparation process. People will indulge in making delicious sweets and snacks for the festival. 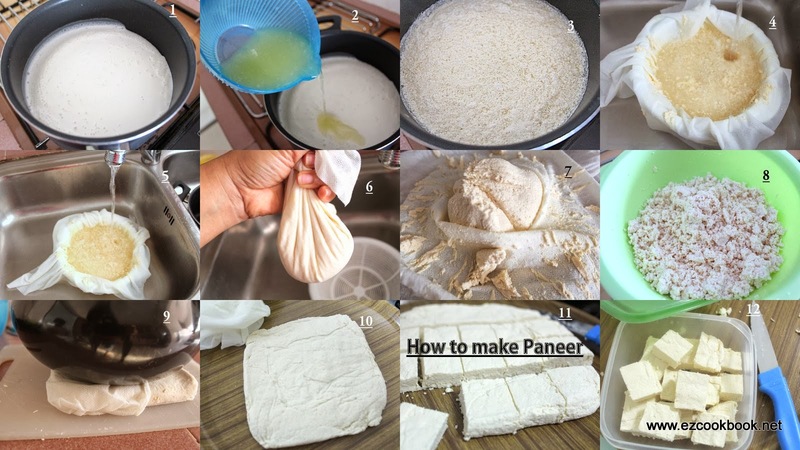 Today I would like to share the recipe of homemade paneer, one such versatile ingredient that lends to make delicious sweets and dessert, also idle for making variety of Paneer Recipes ranging from simple gravy to exotic dessert. It is a type of cheese first made in Indian continents and popular known all over the world as Indian Cottage Cheese. Paneer is basically made by curdling the milk and it has good source of calcium in it. Once you give a try to make paneer at home, I swear you will never again go for store-bought one. And the whey (the leftover water from curdled milk) can be used for kneading the dough or use just like water to any dish. Even you can reserve the whey(instead of citric acid) in refrigerator for making paneer again at home. Paneer blends easily with any ingredients and that's why many vegetarian food lovers include it regular in their diet. Cooking Time : under 15 mins. Boil the milk in non stick heavy bottom pan. Mix lemon juice in half cup of water and slowly add this mixture in boiling milk. stir gently. The fat or curd will start separating from whey. turn off the heat. Once the fat has separated completely from whey strain it. Line in a muslin cloth in strainer and strain all mixture in it. Only fat will get collected in muslin cloth. collect the whey/water and use it in cooking rice, making douch etc. Keep this fat/paneer along with strainer in running water for 1 minute so all the lemon content will wash out from paneer. Wrap the cloth and press hard and squeeze out all the water from it. Tie the cloth and hand it for 15 mins. At this stage we will get crumbled paneer. Take it out in a bowl if your recipe called for Crumbled Paneer or Chenna. Crumbled paneer which is kneaded by hands to a dough like consistency called Channa which is used for preparing sweets/desserts or even for making delicious kofta curries. Few Recipes which calls Chenna/Crumbled paneer are Rasgulla, Rasmalai, Malai Laddo, Kalakand and many more. Also make Paneer Bhurji and stuff it in paratha, sandwich, kachori or paneer balls. For making Paneer cubes, set it under heavy bottom vessel for 2 hours. I used Pressure Cooker. Keep it again in fridge for 1 more hour to get firm Paneer. Take it out from cloth and you will get a nice firm block of paneer. Cut it them in desired shape. I cut them in square cubes. Use it fresh in your recipe. Or store in a air tight container or zip lock plastic bag and refrigerate it. It can be stored in fridge for 3-4 days. It will be fresh for months if kept frozen. Use this paneer cubes to make Paneer tikka, Palak Paneer, Paneer Butter Masala, Mutter Paneer. Do not discard the whey/water while straining panner. Whey is as healthy as panner so use it in regular cooking. You can add spices as per your taste while setting it i.e. black pepper, mint, garlic or add sugar in milk while boiling to get sweet paneer if making it for desserts or sweets. Colour and quantity may vary with the milk we use like buffalo milk/cows milk, full cream/low fat milk, fresh/ pasteurised milk. Poori, a famous Indian breakfast delicacy. Delicious is the only word for these pooris. They are best to pair with Potato Masala. Without a doubt, these pooris can tempt anyone around the world to give a try. One such easy to make favorite breakfast or snack recipe. However making fluffy poori is really a trick task for everyone. Just follow my tips to make fluffy, crispy poori. First the dough should soft, pliable. Second oil should be hot enough to deep fry poori. Falafel a world famous and versatile Mediterranean food. It can be served as a appetizer or with main course too. Here I tried to give it a green and healthy twist by adding spinach in it and baked it instead of traditional way of deep frying. It came out extremely delicious and crispy. I served it as a sandwich with pita bread along with tzatziki sauce which was the extra ordinary combination and a HIT in my family. Here comes the recipe to make baked spinach falafel. Dosa Sandwich, a very refreshing and quick to make snack. Every time to make snacks for weekend is a taunting task for me. Especially my Hus who is keen about health says no to deep fried, heavy snacks. So this weekend I had an obsession in my kitchen to do something new but lite and healthy food. Tzatziki sauce is refreshing tangy and cooling dip made with easy ingredients. It is a versatile condiment which can be served as a salad dressing, sandwich spread, dip for grilled veggies or meat, kababs and tikis and often with pita bread too. I made it to accompany with baked spinach falafel sandwich and this combination was really delicious. Try out this recipe given below. One of the easy,healthy, quick to make snack I prefer to give my daughter after school is Verkadalai sundal. It is one among the sundal recipes that is made during nine days of navaratri festival. Thought it would be perfect to post now for navratri. The nine days of festival will be very delightful and colorful. Especially love those charming little kids dressed up beautifully and arrange the kolu with as many cute idols and dolls. The glimpse of navaratri can be seen all over India, all streets and roads were jeweled with decorations and temples are crowded with devotees. Vegetable Manchurian Gravy, One more popular delight from Indian-Chinese Cuisine. If Manchurian are made in dry version then it can be served as a appetizer but when cooked with a gravy then it can be a perfect side dish for main course. I know most of you order this dish when you dine out in a Chinese Restaurant. Why not cook it at home tonight and surprise your family!! check out this Easy Recipe to make Vegetable Manchurian Gravy. One of my favorite snack rite from my childhood is undrallu. In TamilNadu it is called as Ammini Kozhukattai. Whenever I go back India, my ammama(grandma) use to make undrallu for me. She knows all my favorite recipe and she never fails to do so. Her style will be quite different, she use to season the undrallu with two different methods. First type with spicy tamarind sauce and second type with kobbari pappu (coconut yellow lentil) combination. Both these versions are paired in a plate, we use to relish it mix and match effect. Navaratri, Dussehra or Durga Pooja is the most important festival celebrated in India. This festival is celebrated for nine days during the month of October. It is celebrated almost all over India and people from each state celebrate in their own way. In my house at Chennai(TN) we used to celebrate the ayudha pooja and saraswati pooja which falls on the ninth day of the festival. Ayudha pooja is performed to all vehicles whereas saraswati pooja is performed to goddess of art. Books, office documents, instruments are kept for her blessings. The make over of the entire home will be in full swing. Amma will clean and wash the whole unit, Dad use to wash his vehicles, our cycles and apply sandhan(sandhal wood) paste with kumkum and decorate with whole new look. Me and my sisters use to bring all our books and arrange neatly in a desk in front of pooja room. Aval, poori, vellam is offered as a main naivedhyam to goddess Saraswathi and distributed to all. Vidyarambam Karishyami Siddhir Bhavatu Me Sada. Navaratri, the first thing that comes to my mind is sundal(tempered legumes), all these nine days the Brahmin community people use to set up golu(arrange idols in nine steps) and prepare variety of sundals(one per day) with various legumes. Sundals and various prasadam are offered to Goddess Durga, Lakshmi and Saraswati for all these nine days. Each of these sundal variety has a unique taste, though the procedure of making is similar -soak the legume previous day, cook and temper with mustard, curry leaves, chilli and coconut. And it's almost available at every home for nine days. Here we present some of the sundal, sweet, rice and snack recipes that is usually made for this festival. Also don't forget to check the Navratri fasting Recipes.